Alton Towers Hotel – TowersStreet - Your premier Alton Towers guide! The Alton Towers Hotel is centred around the wacky inventions of Sir Algenon Alton, with his five-storey time machine parked right in the middle of the foyer! Throughout the Hotel are relics from his travels around the globe, from the reception desk made of lost luggage, to the massive chair on the next floor down (always providing a perfect photo opportunity!). Guests will find magical touches scattered throughout the hotel for them to discover, notably the magical lifts and Sir Algenon’s doorbell (which should always be rung before entering the hotel). The style and décor is generally more sophisticated than it’s next door neighbour hotel, and you’ll find the Resort’s award winning Spa nestled on the far side of the hotel. So pull up a giant chair, order your favourite tipple and unwind at the Resort’s original hotel. Even a standard room in the Alton Towers Hotel is a quirky place to rest your head, with an eclectic mix of themes and styles. The rooms include a double bed and a combination of bunk beds and pull-out beds depending on how many people it accommodates (rooms are available in 4, 5 & 6 berth). When they were first redecorated into the current style in 2003, the rooms were known as Discovery Rooms, though in recent years they’ve reverted to the name Explorer Room, harking back to the name of the original rooms at the hotel. The Arctic Explorer rooms take guests on a trip to the tundra that is the corridor between the Conference Centre and reception. Themed around a stay in an arctic snow crawler, the rooms include air conditioning, a double bed, adjacent day bed with an additional pull out bed underneath. Arctic Explorer rooms sleep up to 4 people. Join Sir Algenon, as he takes you on a journey out of this world in these galactic themed rooms. The detailed theme for each of the rooms starts in the hallway outside and runs all the way through the bedrooms right into the bathroom. Each of the Moon Voyager rooms can sleep 4 or 5 people, and includes a separate area for the kids, with it’s own TV and Xbox. As exclusively revealed by TowersStreet during construction, the mind-bending roller-coaster has its very own themed room in the Alton Towers Hotel, which opened on 28th March 2013. Nothing can marmalise you in quite the same way as a stay in this bright but clinical environment, designed to convert even the staunchest of advocates. The room can sleep upto 4 people, and features a number of augmented reality features (compatible with most smartphones and tablets) that are sure to leave you smiling. Join Charlie and Lola in their themed bedroom. Do you fancy a special treat? Take part in the buggy trail treasure hunt to try and find Charlie and Lola and their special treat. This room sleeps up to 5 people. It opened in May 2014 with CBeebies Land. You could become a postman with Postman Pat, by helping him sort all his parcels. As a reward you may find yourself a little treat! This room sleeps up to 5 people and also contains a selection of Postman Pat DVD’s. It opened in May 2014 with CBeebies Land. Join Tom in your very own treeling hideout. This secret room is alive with the sounds and smells of Treetopolis. Help Tom, Twigs and their friends use Big World Magic to reveal the location of a special treat! This room sleeps up to 5 people. It opened in May 2014 with CBeebies Land. The ultimate romantic hideaway, this room for two is themed to an Arabian desert tent. With stunning detail and a bathroom fit for a Queen (of the desert! ), you can be sure Cupid will be your friend during your stay. The Arabian Nights Suite is now the only original room left in the entire hotel, having first opened its flap in 1996 when the hotel opened. The ultimate bedroom where everything is styled to look just as snuggly and comfortable as it can possibly be. Get under those covers and dream away after a busy day at the theme park! The Big Pyjama Suite first opened in 2004. The Beatles all lived in a yellow submarine, and now you can sleep in one! Giant rubber ducks watch over you as you dream of living beneath the waves. This room is the perfect location for water-babies everywhere. The Splish Splash Suite first opened in 2004 as the Imperial Suite (having originally been sponsored by Imperial Leather). It’s celebration time at Alton Towers Hotel and you can continue the party in your room. Enjoy the party atmosphere that the room ignites, as well as a fridge full of refreshing Coca Cola. Inspired by the larger than life celebration of Mardi Gras, this suite made it’s grand entrance in 2004. All aboard the chocolate train as Alton Towers offer a chocoholic’s dream boudoir. The luxurious décor or this travel inspired room, is based around a marvellously understated railway compartment, complimented by as much chocolate as you can eat! The Chocolate Room opened as one of the imagined suites during 2004. Immerse yourself in the wonderful world of Beatrix Potter’s Peter Rabbit. These lavishly themed rooms brins the wonderful characters and stories to life as you dream your nights away in this little fantasy warren. The two rooms can be booked independently of one another or together as a suite, as they have a connecting door. They were among the earliest themed rooms to be added to the hotels, opening in 1998. This suite offers the ultimate girly sleep-over room, with areas for partying, real diva style vanity mirrors and lots of luxury. The largest of the hotel’s suites, this room can sleep up to eight guests, making it ideal for hen weekends or special parties alike. The Sleepover Suite opened its doors at 2006 and has everything you could need for the perfect slumber party. These rustic, cottage style rooms are the perfect location for those wanting a relaxing stay at Alton Towers. Less colourful as many of the other rooms in the hotel but perfect those who want a little bit of traditional luxury. As a bonus these rooms come with complimentary Elemis gift bag, Prosecco and three hour access to the Spa relaxation rooms. This room is pretty in pink and the perfect place for a regal treat in the Alton Towers Hotel. You may need to compete in your own royal tournament however to decide who get to sleep in their very own carriage bed. The Secret Garden offers delicious freshly-prepared meals in a relaxed, tranquil setting and is located off the main atrium on the ground floor. The restaurant’s menu changes seasonally and sometime includes less than conventional hotel delicacies such as crocodile steaks. Although the individual meals are not cheap, if you are not a big eater you may find this restaurant more to your taste and easier on the wallet than the all-you-can eat option at Splash Landings Hotel. The Restaurant can get very busy and demand is often high so we highly recommend pre-booking your table to avoid disappointment. Emperor’s Grill is a dedicated restaurant for those carnivores who love to get stuck into a big piece of meat. In particular the grill specialises in steaks with a variety of premium cuts on offer from rib-eye to T-bone. As well as steaks there are a range of skewers and burgers to tempt every meat-eaters dream. Enjoy your meal in Sir Algenon’s own study, seated amongst the many weird and beautiful objects he has collected during his travels. Be aware the meals here tend to be a little more expensive that Secret Garden and the vegetarian option is much more restricted than at Secret Garden. The grill only opens during peak season at the hotel and is therefore guaranteed to book-up early. to relax over a drink in the evening, or to sit while their children enjoy the antics of Pirate Bill, Darwin the Dodo, or the music of the resident band: A-Band-On Ship. This drinks on offer vary from both pump and bottled beers and ciders; to wine, spirits and cocktails. There is also an alcohol free children’s cocktail menu available so young-ones can enjoy a refreshing drink with their parents. When the Dragon Bar is a little busy, as if by magic a wall in the atrium moves aside and another bar magically appears. This bar offers the same products as the Dragon Bar and uses the seating provided in the Atrium. 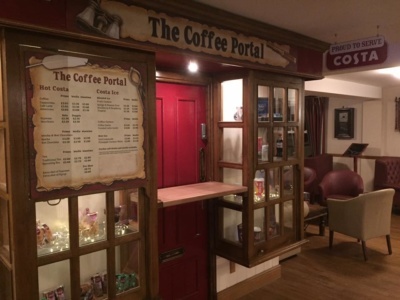 An ideal spot to grab a cuppa before you head out for your day on park, the Coffee Portal is conveniently located in the reception of the Alton Tower Hotel. The portal opened in 2016, in the shop front that had formerly been an annual pass desk and most recently been used as the reception for the Altonville Motel during the 2012-2013 Scarefests. The atrium is the centre-piece of the Alton Towers Hotel and is also the place to grab light mid-day snacks. The lunch menu is generally a specialist sandwich fayre and is more expansive than the pre-packaged sandwiches available at the Coffee Shack in Splash Landings hotel. The atrium is also linked to the two bars at the hotel and is the perfect place to take your drinks to watch the evening entertainment. In March 1996 Alton Towers opened their first themed hotel to the public, marking the start of Alton Towers’ transformation from day-out into a short break destination. The hotel was not the first attempt the park had made at encouraging guests to stay over, with the 1970s having seen the current car park’s used for a caravan and camping site, which had been scrapped after a disastrous storm stuck the site. The Alton Towers Hotel was set to follow the lead from some international parks, who had already successfully turned themselves into full resorts by encouraging guests to return to their parks for a second day of adventure by offering accommodation. Many year’s of planning went into the hotel, during which time other accommodation alternatives were considered, such as a village of self contained villas on the site, though eventually the park decided on the fully themed hotel idea, the first of its kind in the UK. Several of the hotel’s opening features closed within the early years of the hotel, as the park discovered what worked and what didn’t, but it was not until Splash Landings opened in 2003 that large scale renovations began to take place within the Hotel and within the first few years of the new hotel opening, the Pirate’s Lagoon swimming pool had been replaced by the Spa and almost all of the rooms in the hotel had been renovated, with the standard rooms all becoming Discovery Rooms, and several of the themed suites being replaced. Equally the new Conference Centre freed up the original hotel’s conference suite for more varied uses, from being used for Room 13, one of the resort’s earlier Halloween Scare Mazes, through to it’s current use as a restaurant during the peak times of the year. When the Alton Towers Hotel opened all of the rooms were themed to some extent, with even the standard rooms themed to one of two designs. One of these designs was the Explorer Room, which invited guests into a world of adventure, with a secret drawer to be discovered and decoration based around a vintage map. Around the room could be found various trinkets brought back from Sir Algenon’s travels, including a lamp made from the boots of Captain Henry Morgan. 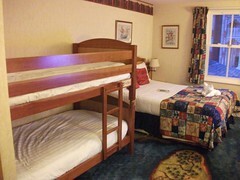 The original Explorer Rooms are the rooms that contain double bed and a set of bunk beds, and were rethemed into Discovery Rooms in 2003 after the opening of Splash Landings. The other half of the rooms at the Alton Towers Hotel (those without bunk beds) were the Garden Rooms and as you might expect these were much more traditional in style, with strong floral motifs around the room and wallpaper inspired by trellis. Despite the more traditional theme, the hotel still brought quirky details into the rooms, such as with lamps made out of watering cans and straw hats. In 2003, all of the garden rooms were rethemed into Discovery Rooms (now the modern Explorer Rooms), though you can still tell if your room used to be a Garden Room if it doesn’t contain bunk beds. When the hotel first opened, it had two luxury hotel suites for two people located on the upper floor of the hotel. Alongside the Arabian Nights Suite, the Princess Suite offered pampered luxury for those who wanted to spend a night in their very own fairytale medieval castle. Offering a much more traditional style, the Princess Suite was always the less popular of the two luxury suites, and so in 2005 it was amongst the first set of themed suites to be replaced. The Princess Suite was replaced by the family friendly Imperial Suite (now the Splish Splash Suite), though hidden reminders of the suite can still be seen in both the Splish Splash Suite and Big Pyjama Suites, which both reused various pieces of furniture from the Princess Suite. In 1996, the new hotel brought new sponsorship opportunities to Alton Towers with Coca-Cola sponsoring the Fizzy Factory, bringing a refreshing night’s sleep to any guests staying in this ‘olde worlde’ drinks factory, complete with all you could drink from an old fashioned drink fountain. The suite, located on the top floor of the hotel, could sleep up to six and was a popular choice for guests, so much so that when the suite was removed in 2004 the “all you can drink” concept (and some of the furniture) was retained in the new Celebration Suite. The Fizzy Factory itself was replaced by the Big Pyjama Suite. The other sponsored room that opened with the hotel in 1996 was the Cadbury’s Chocolate Room, which allowed guests to relax amidst surroundings that Willy Wonka himself would be proud of. As well being themed as though it was a selection of chocolate bars and treats, the room offered it’s guests as much chocolate as they could eat, some of which could be found in vintage-looking vending contraptions, which adorned the walls. There is still a Chocolate Room in the hotel today, though this is much smaller than the original and located on the floor below. The original Chocolate Room closed in 2003 to be replaced by the Celebration Suite. For many years the brave could test their nerve by spending the night under the watchful gaze of the Nemesis monster in this unique themed room. The Nemesis Room did not open with the hotel, but arrived one year later in 1997, a sign of the success of the hotel’s themed suite programme and their desire to expand the offering. Unlike the original themed suite, the Nemesis Room was created out of one of the hotel’s standard rooms and could therefore only sleep four people. Despite its late arrival on the scene the Nemesis Room was one of the first to be removed in 2003; the idea of sleeping beneath the Nemesis monster possibly dissuading potential customers from booking. It was replaced by the new Chocolate Room, a style which is a world away from the room’s monstrous past. 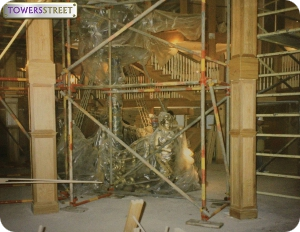 1998 saw the hotel expand it’s themed suite offering once again, one of the new rooms being based around Oblivion, the park’s latest coaster project, which offered a very modern theme, and was very different to that offered by all the other themed suites. As with the other additional themed rooms added after the initial four, the Oblivion Room was created out of the standard room stock, and likely saw two standard room knocked together to create a suite that could sleep up to six. The Oblivion Room was one of the few rooms to survive the first round of room rethemes in 2004, but even then its days were numbered and was removed two years later. In 2006 the futuristic and rather stark Oblivion Room made was for the girly opulence of the Sleepover Suite. If the cuddly world of teddy bears is your idea of a perfect place for a short break then these were the rooms for you. Arriving at the resort in 2007, both Tatty Teddy rooms were designed to be able to sleep up to four guests, though the Dreamy Den was aimed at couples on a romantic break, whilst the Hidden Hideway was more family orientated. You could immerse yourself in the world of Tatty Teddy in these beautifully realised suites through to 2014, when Tatty Teddy left the resort. The two rooms still exist in the hotel today, though without their Tatty Teddy branding, and are now both aimed at luxury breaks for grown-ups, with pampering gifts and a bottle of Prosecco upon arrival. This is a gamer’s dream room! With its own dedicated gaming area you can play your way through a catalogue of Sonic’s adventures. If you dream of falling to sleep in the Green Hill Zone surrounded by super-speeding blue hedgehogs, then this is the room for you. Sonic sped his way into the Alton Towers Hotel in time for the 2010 season. Sonic stayed at the hotel until the end of 2016 and was replaced by the Princess Room for the 2017 season. Make yourself at home with Mike and his friends in the Kingdom of Glendragon. Do you have what it takes to become a knight? Take part in the Mike the Knight magical treasure quest challenge to find a special reward! This room sleeps up to five people. It opened in May 2014 with CBeebies Land and was the first of the CBeebies themed rooms to be removed, closing part way through 2018. The original pool complex opened with the hotel in 1996 and was located in a secluded spot at the very end of the building, beyond the guest bedrooms. As the name suggests the pool was themed around a fantasy pirate’s hideaway and as such the walls were adorned with sumptuous hand-drawn murals, creating a truly unique atmosphere. Above the swimming pool, looking out over the action was a large games room, which was home to Pirate Bill’s Kids Club. Unfortunately, for the size of the hotel, the pool complex was rather small, which meant that for much of the year capacity was strictly limited and sessions had to be booked to use to the pool. And so, when a second hotel was planned, this situation was rectified by the inclusion of a full waterpark as part of the new development. This meant that Pirate’s Lagoon and the connected games room were both closed mid-way through 2003, before being transformed into the Alton Towers Spa we see today. When the hotel first opened, on top of the food and drink offerings seen today, there was also a traditional tea shop on offer, for those looking for a lighter bite than the Secret Garden offered or just looking for elevenses once they’d checked out. Time For Tea’s shop façade was located on the entrance level in the opposite corner to the reception desk, though its seating spread throughout the area. It would seem the shop was less than popular, which when combined with its awkward position resulted in it’s closure within the first couple of seasons of the hotel’s opening. Despite it’s long absence, remains of Time for Tea can still be seen around the hotel lobby, from its shop front, which is now used for the sale of Park Tickets and upgrades, through to decoration, with the walls of clocks being left from these times gone by. Another opening attraction for the hotel was the Nickelodeon TV Lab, a highly themed TV Room, where classic Nickelodeon shows were on tap throughout the day, the perfect way to unwind after a busy day on park. Nickelodeon’s connection to Alton Towers was relatively short-lived, and it is likely that the TV Lab closed at the same time as Nickelodeon: Outta Control in 1999. It is unclear as to exactly when the transformation occurred, but the TV Lab is now used as the Alton Towers Hotel’s Game Room.